When shopping for corporate apartments in Boulder it is important that you are comparing "apples to apples" and asking the right questions. 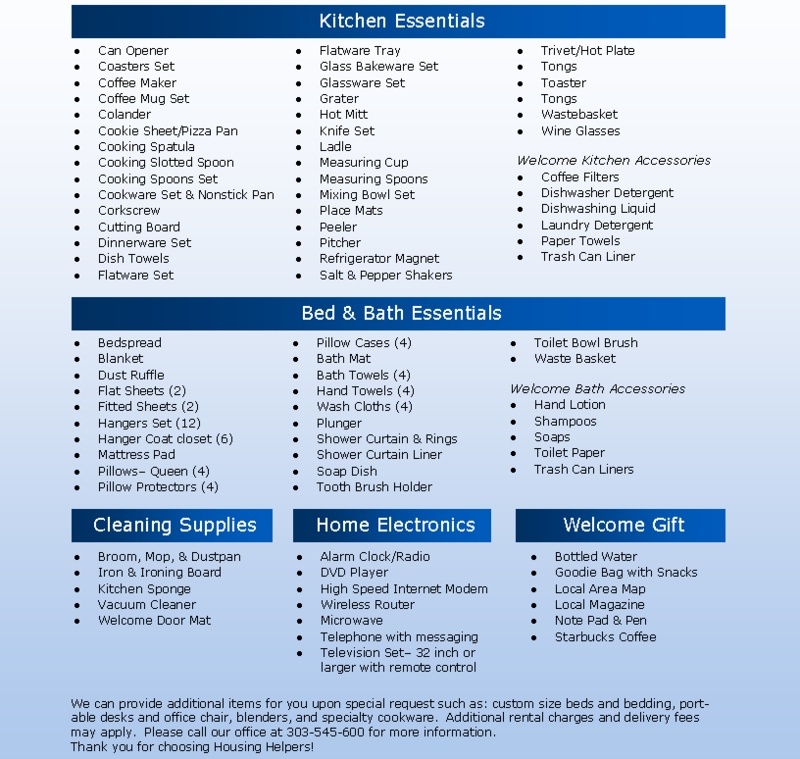 What bedding, linens, and towels are included? Are high speed internet, cable tv, and phone? Are all utility bills included in the rate? Do you charge any move out fees or pet fees? Do you provide direct billing or invoicing? What happens if an emergency occurs during my stay? How quickly do you respond to service requests? How do you handle check-in and check-out? Are you a member of the CHPA? Do you have guest references I can check? Whenever possible choose a designated Professional Corporate Housing Provider to handle your corporate apartments. There are a lot of options for corporate apartments in Boulder. In Boulder alone there are hundreds of furnished corporate apartments in service at any given time. In addition there are hundreds of privarte owners advertising furnished condos and houses as corporate rentals in Boulder. This means a lot of choices but it also means a lot of pitfalls. A Professional Corporate Housing Provider adheres to minimum standards and a code of ethics to provide quality corporate apartments and temporary housing to business travelers as well as individuals in need of temporary accommodations. This means that when you rent a corporate apartment in Boulder from a CHPA member you can rest assured that you have made a good decision. Call your Boulder Corporate Apartment Experts today! "Thanks for the great corporate apartment! I really like it. I appreciate you making such good arrangements. The apartment is very nice and the welcome arrangements were excellent. Thanks a lot!" "We have been very satisfied with our corporate apartments. Thanks again to Housing Helpers for the work you did to make this happen for us."